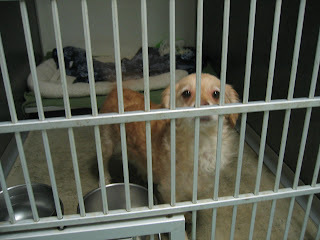 This is the dog that I tried to adopt for my brother's family last week. She was a two year old female spayed something that had been rescued by a group that shall remain nameless. I had known her for over a month and had personally taken her on walks and even long hikes. I had seen how she interacted with strangers as well as other dogs. She seemed wonderful and I thought she would be the perfect fit for my brother's family. They have a large enclosed backyard and my sister-in-law's full time job was raising my four year old niece. Call me naive but I expected the rescue group just to hand the dog over to me. After all, I had a good relationship with them and they trusted me to treat their other animals (both medically and surgically) so you would think that they trusted me to find one of their pets a good home. Their first request was that they have my brother fill out an application form. I can't reproduce the entire form here (that would take up WAY too much space) so I've decided to make up my own form which shows you the spirit of the original. Do you have a gardener, house keeper or pool cleaner? If not, please explain. If yes, please indicate if you are currently in an intimate relationship with him. Who is your veterinarian? Do you trust him/her? Please explain. I understand that filling out this application does not guarantee the adoption of a pet by our rescue organization. Please allow 4 to 6 weeks for us to do background and credit checks. If you are an illegal alien, please allow more time. I agree that all of the above information is honest and true. And guess what, my brother was DENIED!